This correction has been very fast and furious. 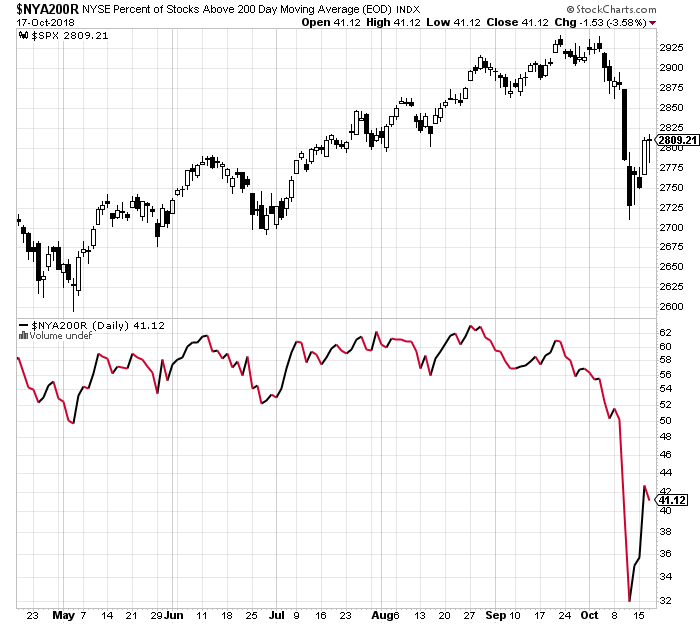 I talked about it yesterday and how downside momentum was beginning to wane. The old saying that stocks take the stairs to the tops and the elevator to the bottom definitely rings true here. This decline has been relentless with strong wave after strong wave of selling. I can spend a lot of time debating why stocks have declined, but does it really matter? The stock market usually discounts economic activity 6-9 months down the road. However, it’s far from perfect. The media feels like they must assign a reason for each and every daily move in stocks. That’s not how markets work. Several weeks ago, I published a blog piece about what was looking like an interest rate driven decline. http://investfortomorrowblog.com/archives/3825 The thing is, long-term rates peaked on October 5 and went straight down to October 26. They are not well correlated although perhaps there is a lead/lag relationship. Many high profile companies have beat their earnings estimates, however their top line revenue numbers have missed. Investors didn’t sell because of what happened last quarter. That’s old news, history, in the rear view mirror. They sold because they believe that lower revenues will continue and begin a new trend. I happen to believe that the election is causing more consternation in the investing community than people are publicly admitting. Although I will update my election model this weekend, it certainly looks like the House will go blue by at least 5 seats and the Senate will gain one or two red seats. Basically, that’s a return to gridlock and an end to the GOP’s pro-growth, low tax agenda. That’s one of the reasons I have been forecasting the ultimate low during the first two weeks of November. We have an election overhang. The selling has been relentless. It’s come in strong waves with some of the most powerful moves in many years. If you watch the intra day “tick” indicator which essentially tells you the cumulative price move for all stocks on the NYSE, up or down, there have been two massive and historic waves where the tick exceeded -1600. That shows indiscriminate selling and it’s not mom and pop hitting the sell button. The reasons are not important and we never truly know anyway. Right now, it’s “get me out at any price!” The magnitude has certainly exceeded my call for a mid to upper single digit decline. 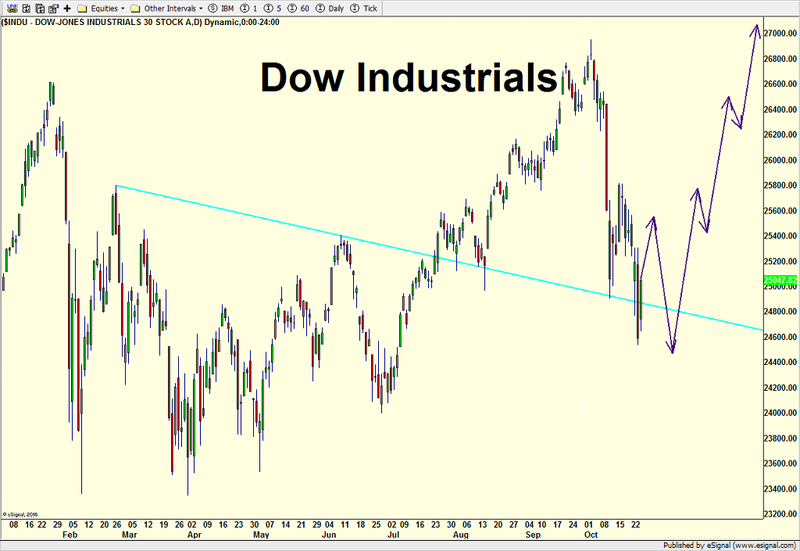 In the very short-term, there should be a rally and I don’t mean a few hundred Dow points. It could be significant. 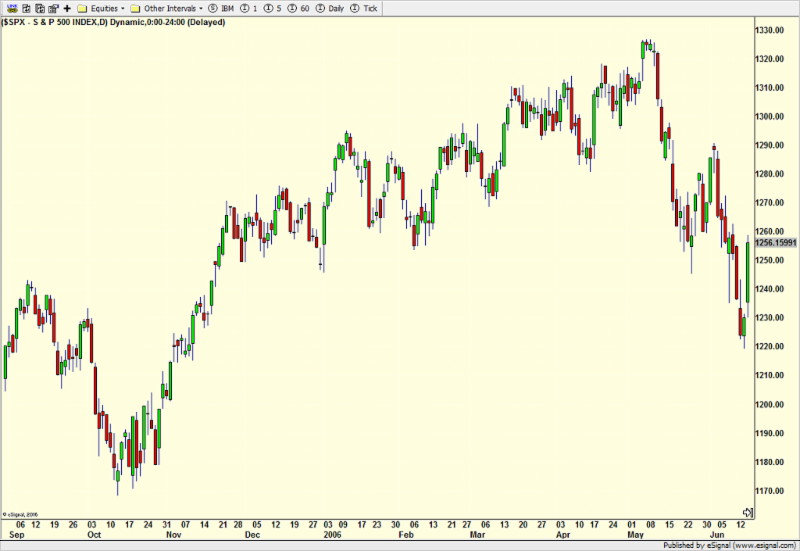 However, I think this rally also fails and leads to a final selling wave over the coming two weeks or so. If you are looking for bright spots, there haven’t been many. Banks have not made new lows since last week. 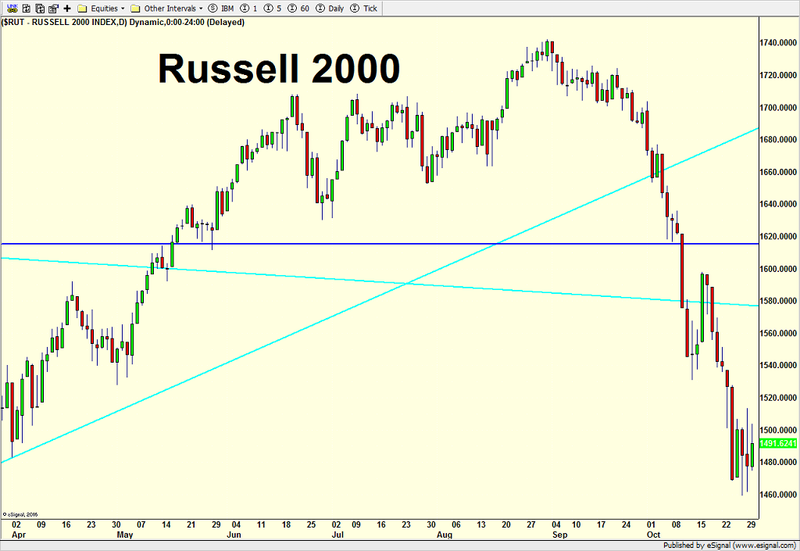 The Russell 2000 small cap index did not make new lows on Monday. 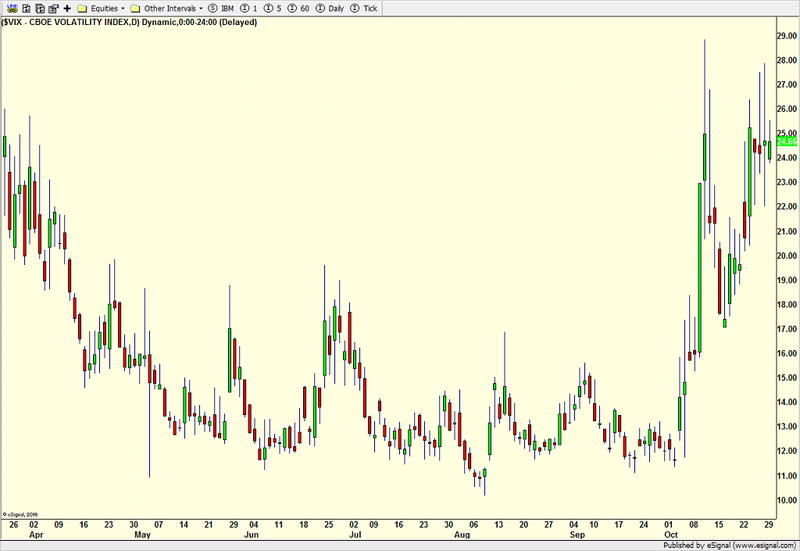 The Volatility Index (VIX) remains below the levels seen on October 11. There are more signs like this, but not enough. My point is that downside momentum is just starting to wane. That rarely happens right at the bottom. It is usually a leading indicator. Patience is needed now. The “thrashing around” I keep calling for is here. It’s easy to make emotional mistakes. Don’t do it! I started out my day with a visit to CNBC’s Squawk Box at 6:15am. I should have the link to post later today. I will be with the good folks at Yahoo Finance on Midday Movers either right at 11:30am or noon, live from Heritage Capital’s global headquarters via Skype. There’s an inside joke in there which I am always willing to share in person. As you know from all of my posts, markets have been very volatile and even unnerving for some. I am going to discuss when I think stocks may find a bottom, how and at what price zone. I had hoped to have an update done on Friday with some indicators to watch for a low in stocks but the depth of the decline forced me to wait until after the close and the weekend has been kind of insane with two bar mitzvahs in Saturday and the final weekend of baseball with party to follow at our house. To make matters worse, both my wife and I have been a little under the weather. On a happier note, however, Mount Snow opened on Saturday so ski season is here with one of the earliest openings ever. If you’ve never skied during fall foliage in Vermont, it’s definitely a bucket lister! Back to the stock market, I said on Wednesday and Thursday that the ultimate low from this pullback, now correction, was still in front of us and lower prices were still ahead. Friday’s action was interesting as it had something positive for both the bulls and bear during the day. The bulls, once again, staved off the mini crash scenario while the bears were able to push off the final low. The bulls really need a stand on Monday, ESPECIALLY if stocks open higher. I don’t think the bulls can afford an up opening and then downside rout. 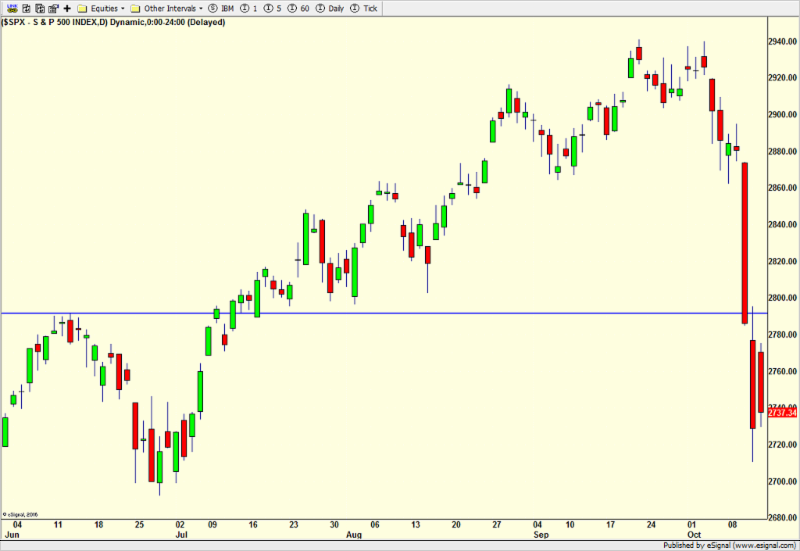 That would open up lower targets that I had not considered this year. Alternatively, a weak opening followed by some firming would also be okay for the bulls. The bears, on the other hand, want to aggressively sell any morning strength and press it after lunch. They could also win by seeing a lower open and then a heavy trading day where stocks stair step down right into the close. Those are your four scenarios for Monday. It should not be a quiet day! 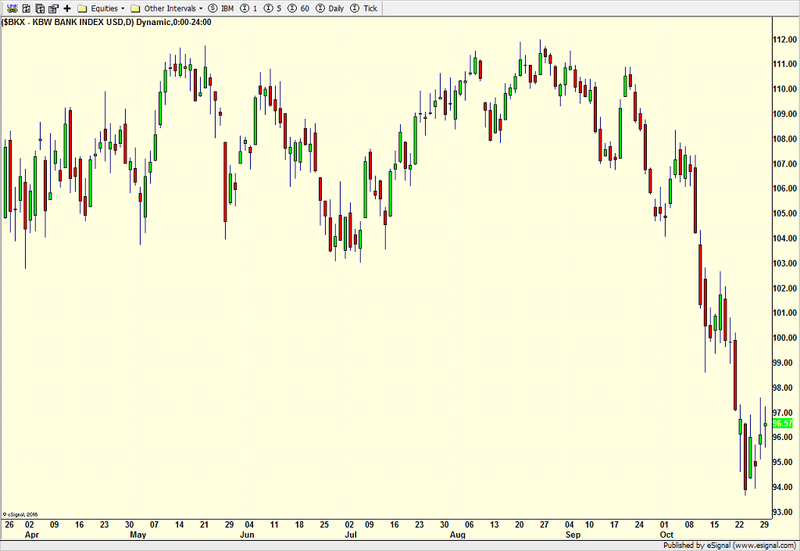 Looking at my four key sectors, banks transports, consumer discretionary and semis, they all basically look like death. After this correction bottoms, it’s going to be really interesting to see if they regain bull form. If not, that will be a telling sign that this old and wrinkly bull market will likely die during the first half of 2019. Remember, I still have a projection of Dow 27,000 after the Dow closed above 25,000 for five straight days. I am not abandoning that down here. Well folks, it’s been quite a week so far. After stocks tried to hammer in a low on October 11th there was a rally as I expected. In fact, that October day was the first day our shorter-term investment models started turning positive with the Dow at 25,000 after having been negative since the all-time high peak on October 3rd. As I wrote at that time, I didn’t think 25,000 was going to be the ultimate bottom, but the majority of the price damage was done. Moreover, my biggest concern would have been that stocks headed straight back to new highs from 25,000 and that would likely have spelled the end of the bull market. That’s still a possibility from Wednesday’s low, but I don’t believe that’s a likely one. Additionally, there were two scenarios I was looking at that from 25,000 that called for rallies and then more downside. Both are open today, but I favor the more bullish one. Speaking of today, it was vitally important for stocks to rally, something I very rarely say. I use the word “vitally” because mini crash scenarios unfold from oversold conditions like we saw on Wednesday. If the bulls didn’t make a stand today, I would be very worried that a snowball was already in place to the bottom, meaning more weakness on Thursday and Friday with a climax early next week. Thankfully, I don’t think that’s now a valid scenario. By the way, before I offer some charts, some people ask why I sometimes use the Dow versus the S&P 500 and vice versa. It really doesn’t matter. They are so closely correlated, meaning they basically mirror each other’s moves. The general public prefers the Dow while others use the S&P 500. Truth be told, the Wilshire 5000, Russell 3000 or Value Line are probably the most representative. Below is a chart of the Dow Industrials this year so you can see both the Q1 and Q3 declines. On the far right side of the chart, you can see the arrows I drew in to offer my most preferred scenario. In words, I think the rally that began today will continue into next week before rolling over again to the downside where new lows will be made. That means I do not believe the ultimate bottom or lowest levels have been seen yet. However, assuming the next decline is the last, our upside projections to Dow 27,000 remains in place for sometime in December or January. During this entire 10 year bull market, every single time there has been a bout of weakness, the bears, gloom and doomers and those praying for armageddon come out of the woodwork to espouse their negativity. I have heard it all. First it was that all the banks were insolvent and they would steal our money. Then it was that all the money printing would create massive inflation and the U.S. dollar would be worth nothing. Then it was that the U.S. would default on her debt. And an Ebola epidemic. And who could forget that Trump winning would kill the markets and economy. Let’s not forget the countless times Chicken Little cried that recession was coming. Or that China was collapsing or taking over the world. I can’t keep that one straight. And now we have tariffs and rising interest rates and yet another economic slowdown. The thing is, they are all valid reasons that make sense. They have just been embarrassingly wrong. Being years early is still being wrong. Sorry. One day, that permanently negative crowd will have their day in the sun again. And I fully expect them to beat their chests and claim how right they were all along. You will find them throughout the media taking their hollow victory laps. The bout of weakness we are seeing now looks nothing more than your typical late stage bull market pullback. It is doing significant damage that perhaps won’t be recovered from, but I do not think the bull market is over just yet. I called for mid to upper single digits last month and stocks are right up against the top of that range although I think it will end up being 10%+ when all is said and done. Magnitude has always been more difficult for me than direction. Finally, I received more than a few emails lately about the markets. The common question I got was what should investors do now if they never sold. Sorry, but I gave so many warnings of what I thought was coming, you’re on your own. I wrote that I was taking serious action in client portfolios. If that’s not leading the horse to water, I don’t know what is. Your greed got in the way. My allegiance has been, is and always will be to clients first and foremost. That’s why they pay me for my services. I give an awful lot of information for free. My allegiance has been, is and always will be to clients first and foremost. That’s why they pay me for my services. I give an awful lot of information for free, like selling Facebook, Netflix and Tesla. 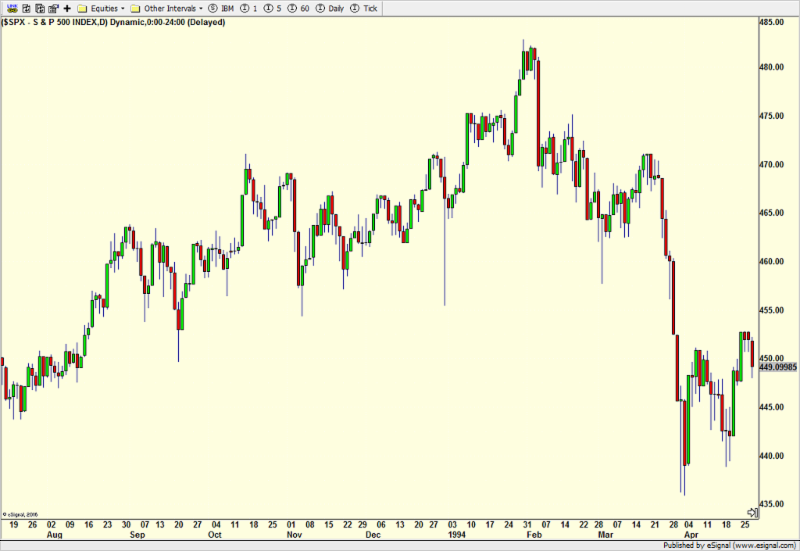 Buying Ford, Gap Stores, Newmont and long dated treasuries. I am not about to offer more. Tomorrow, I am hoping to post some free indicators you can find online to help guide you to the bottom I see coming. As I finished this update, Amazon appears to have an earnings problem and the NASDAQ is collapsing after hours. Friday is going to be fun! Long time readers know that I am ALWAYS skeptical of bottoms where price ends the day in the bottom of the daily range. They rarely mark the ultimate low. When some of indicators turned positive at the of October 11, I wasn’t as full on bullish as I usually would be because stocks closed that day near their lows. In subsequent posts, I offered that while the majority of the price damage should be done, I would not be surprised to see a marginal new low made this month. Tuesday’s action qualified as price made a marginal new low, but rallied smartly to close in the top 25% of the day’s range. That served to flush the sellers out. IF that was at least a short-term trading low, stocks would be stronger today. So far, that’s not the case. It’s not only technology taking it on the chin. The weakness is widespread with financials, biotech, transports, metals, materials and energy all seeing selling pressure. My overall theme remains the same; the majority of the price damage has been done. Stocks should continue to be very volatile and thrash around somewhat violently until we get past the election. Clear as Mud. Volatility & Patience. I keep writing about volatility ruling and boy, it is not disappointing! The huge swings high to low and low to high are extreme. It’s all part of the makings of a bottom for a good year-end rally. We did a really good job calling the peak a few weeks and then offered that the majority of the damage should be done after the collapse on October 11, but perhaps not all of the damage. The best I can put it is that the stock market needs some time to repair the damage done by the decline. I expect more thrashing around, but no meaningful upside progress made until next month. The Dow kissed its average price of the last 200 days. The S&P 500 is resting on that same average now. The mid and small caps are well below all important averages. 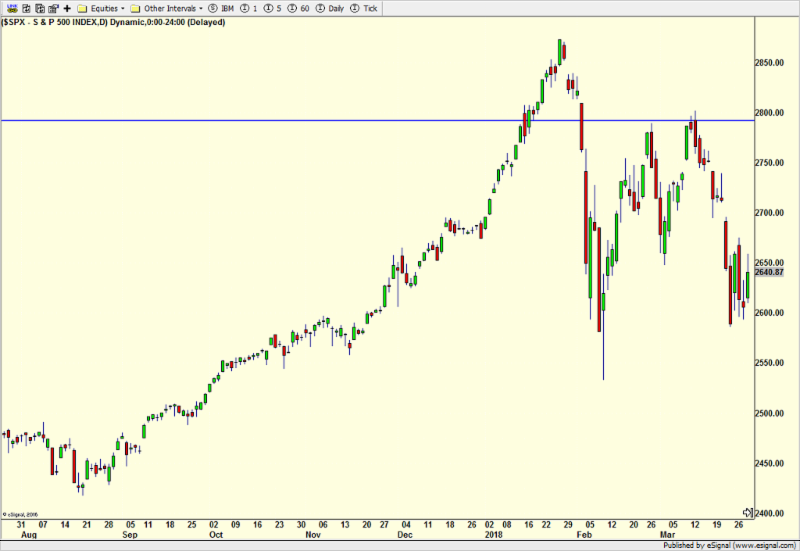 And the NASDAQ 100 looks more like the Dow. Yep. It’s as clear as mud. October 11 saw a number of our key short-term indicators turn positive. However, the stars seem to be sloppily aligning. Semis still look ugly. Transports and discretionary are marginally better. 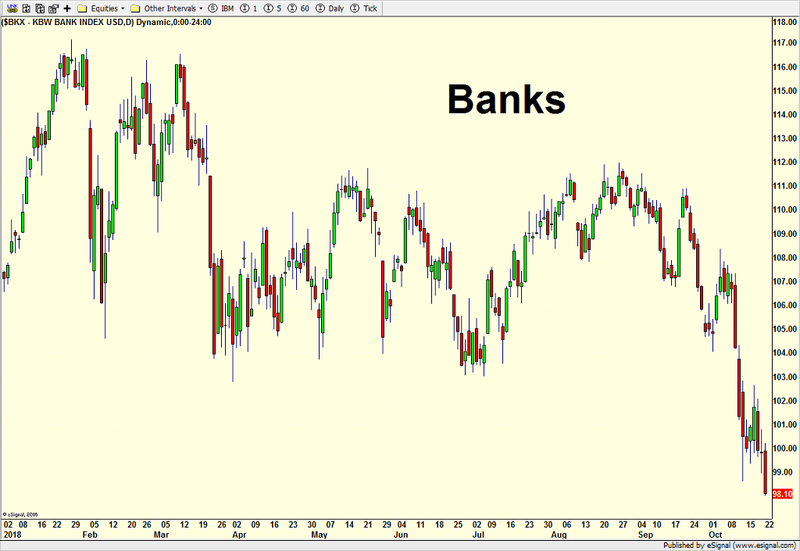 Banks just look plain putrid. At some point, they will be so bad, it’s actually good. But that’s not now. Finally, high yield bonds and the NYSE A/D Line are non-committal. I think besides volatility, the theme is really that of patience. Selectively position, but keep enough powder dry. About the only think I am really encouraged by has been the action in gold and the mining stocks. They have not disappointed. I also like treasury bonds here for a rental, but I wouldn’t give them much room on the downside. They are oversold, owned by smart money and supposed to rally now. And just like that I am back at the airport and waiting to head home on Wednesday night. Just what I like, a jam packed two days and only one night not sleeping in my own amazing bed. As I keep writing about, volatility is going to remain elevated throughout this earnings season and into the mid-term elections. 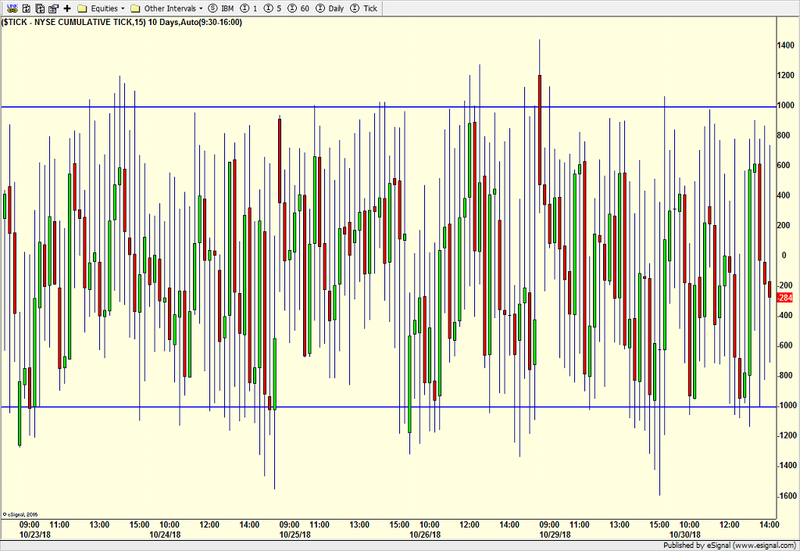 Wednesday perfectly epitomized this as you can see from the intra-day chart below. 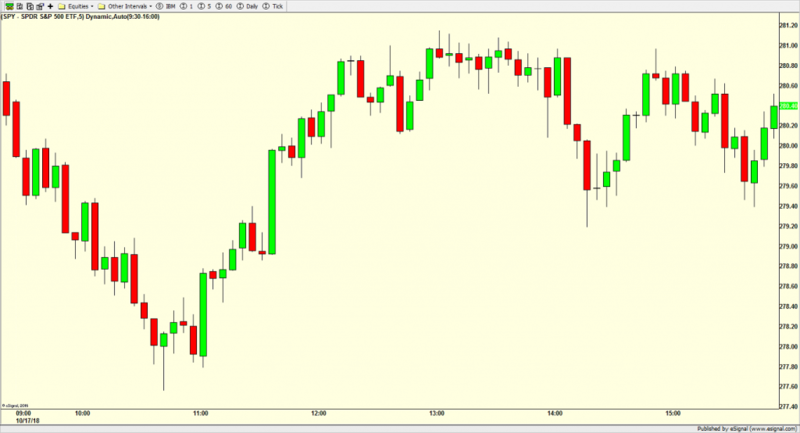 The major indices saw ranges from high to low between 1.5% and 2%. Continue to expect this. Three of the four key sectors have outperformed during this nascent recovery although I am not putting a lot of stock in this just yet. High yield bonds have also led. The percent of stocks in healthy uptrends has taken it on the chin and this needs some time to repair and eventually rally back above 60%. That will be crucial for the survival of the bull market. Again, the majority of the price damage should be over. An immediate return to all-time highs is unlikely and unhealthy. Stocks need time to thrash around and rebuild a solid foundation or the next rally could be the last. In yesterday’s post I mentioned that during most stock market declines, it seems like everyone turns to charts and technical indicators as their economic and fundamental indicators fail. They quote their own “key” numbers and speaking from 30 years of experience, if it’s obvious, it’s obviously wrong. In other words, when so many pundits turn to the same charts, the market does its best to punish the most people. I want to spend a few minutes explaining the most basic and easiest to understand technical indicators which is what you generally hear in the public domain because most pundits aren’t advanced enough to take it any further. The three charts below are of the Dow Industrials, S&P 500 and NASDAQ 100 in that order. 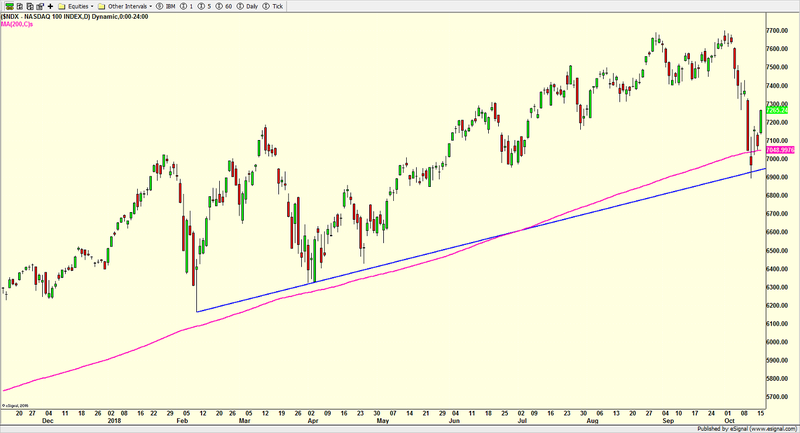 The pink lines represent the average price of the last 200 days, also known as the 200 day moving average. It’s “moving” because every day as one piece of data is added, one piece of data from 200 days ago falls off. 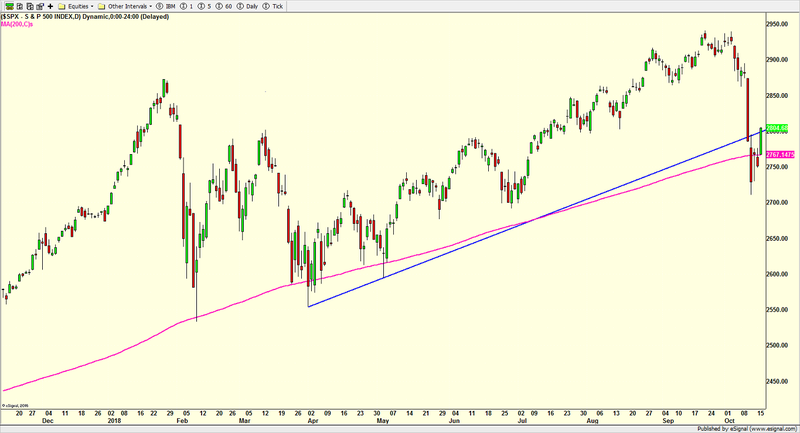 Many people simply use the pink line as a gauge of whether stocks are in an uptrend or downtrend. When price is above the pink line, it’s said to be positive and in an uptrend while the opposite is true when price is below the pink line. You will also notice three upward sloping blue lines which do nothing more than connect the lowest prices from earlier in the year. That’s also known as a trend line. The more times price touches a trend line, the more important that line becomes. Two times is obviously the bare minimum and not exactly all that important. During the decline, I heard some pundits opine that computer driven algorithms or trading programs were the cause of the drop. They were said to be gunning for the pink line so others who buy and sell based on the pink would be forced to take action. I find that mostly nonsensical. What you can see from the three charts below is that all three indices declined to briefly breach their average price of the last 200 days along with saying hello to those trend lines. What’s more important is that at least for now, the bulls put up a stand at the levels they are “supposed” to, namely those pink and blue lines. Was It “A” Bottom or “THE” Bottom? Don’t Get Comfortable Just Yet! 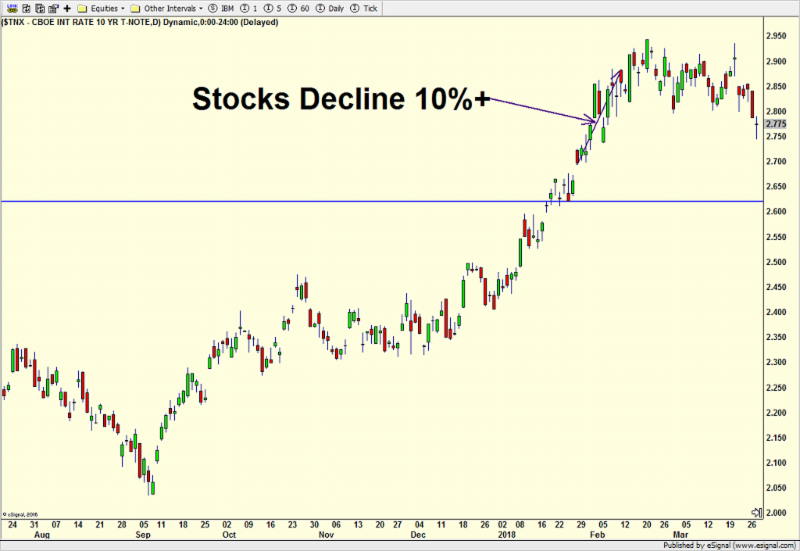 As you know, I had been calling for a mid to upper single digit decline in stocks since late September. 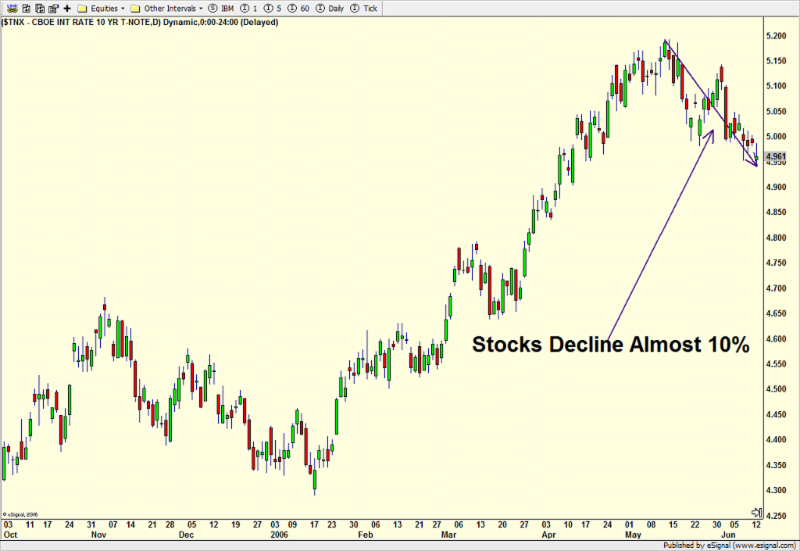 That pullback has certainly come to fruition this month with the major stocks market indices down between 7% and 10%. Last Thursday brought short-term panic readings in some indicators and that served to mitigate more weakness, at least for now. Usually when these conditions occur, the bulk of the price damage has been done for the time being and at this point, I don’t think this time is any different. As such, we redeployed some of our dry powder back into the stock market late last week. Just because the odds favor most of the price damage being done, it doesn’t mean that the volatility is over. As I wrote about last week, I believe the markets will see heightened movement in both directions through early November and the mid-term elections. In other words, the market has now shifted to a short-term time horizon or a trader’s market where weakness should be bought and perhaps, in limited situations, strength should be sold. This is all in the context of an ongoing bull market. Usually during declines, the same group of gloom and doomers email or tweet me that the bull market is over and armageddon is upon us. If I had time, I would go back and see just how awful this group was at forecasting. I would bet that they typically contact me within a day or two of a bottom. Anyway, regarding the end of the bull market, I will publish a full canaries in the coal mine next week. But in the meantime, bull markets do not typically end with stocks going from all-time highs to multi-month lows in a period of a few weeks. As you may recall, bull markets tend to work sideways and roll and roll over time. The first decline does not generate much in the way of panic. More on this next week. As I said, volatility reigns. However, there are lots of instruments worth buying or putting on your shopping list. While stocks have bounced from the lows last Thursday, I do think there is a scenario or even two where those levels will be breached over the coming few weeks. Stay closely tuned. I keep watching the parade of pundits who advise buying right now. Those are the same pundits who never saw the decline coming in the first place and were fully invested. So how can they “buy” when they were fully invested throughout? This morning I watched an interview with Larry Fink, CEO of Blackrock, one of the world’s largest asset managers. Fink has been one of those pundits who is habitually on the wrong side of market moves. I often find that pundits who are wrong have a higher degree of being wrong than those are who usually on the right side of markets. Today, Fink didn’t give so much of an outlook as he did an explanation of why stocks went down. Hedge funds. Yes, he said hedge funds. There have been a number of funds liquidating and returning money to investors and Fink believes they caused a 7%+ decline in stocks. Incredulously, I just shook my head. What hedge fund manager with the vast majority of their net worth in the fund is just going to hit the sell button all at once or over two days? The answer? NO ONE! It was an absurd explanation. Unless a fund is forced to sell because of some type of margin call, they would liquidate in an orderly fashion over a period of weeks or longer. As I pick this back up in the evening, I am now in Baltimore for a few days visiting with clients and stocks have exploded higher, led by technology and small caps. Why? Because initial snapback rallies usually see the most beaten down, rally the hardest. During the decline, it seemed like there were way too many pundits talking about the charts and technical indicators. All of a sudden when fundamentals failed to explain the decline, the masses had to turn elsewhere. But don’t worry. As soon as a rally really gets moving, they will abandon the technical rationale and go back to spewing about the economy and earnings. It happens every time. Rinse and repeat. Summing it all up, the downside objective of the mid to upper single digit decline I forecast last month has been met, but I am not yet ready to declare an all clear. The vast majority of the damage should have been done for now, but stocks are in need of some repair which can be accomplished with time passing. While a 7% pullback usually recovers in a few months, seeing the indices head right back to all time highs in straight line fashion would be very atypical and cause me to have the most concern since the bull market began in March 2009. That scenario could even lead to the end of the bull market like we saw from the August 2007 low to the October 2007 peak. When I woke up today, I wasn’t planning on doing this update. My original plan was to begin a new Street$marts and talk about stock market crashes and the panic I saw in the market over the past two days as well as address some emails I received. This was going to be just one of the articles written. As I got going, it got longer and longer and longer with all of the charts and I ran out of time. Stocks are seeing wild swings right now and Thursday was the first day where the bottoming process began. I didn’t say it was the ultimate low to close your eyes and buy. I did like what I saw with some panic creeping in. 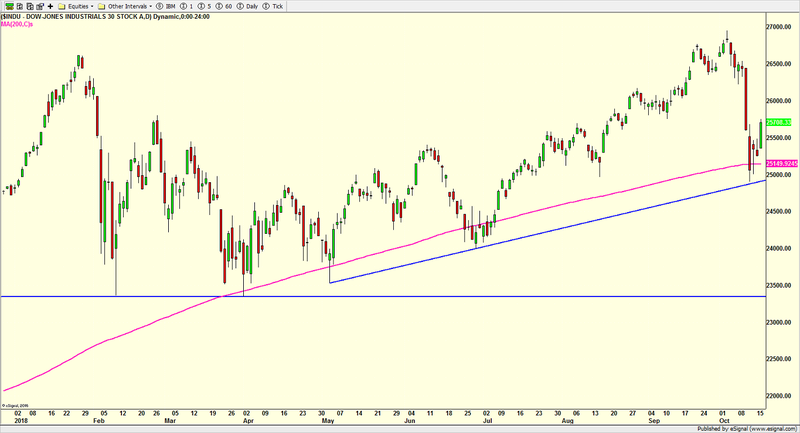 That could mean the first bottom is in or close at hand unless Friday turns out to be bad for the bulls. We shall see. With the dramatic market volatility of late, I want to take a look at what kind of decline this is, meaning how similar is it to other declines and can we learn anything. So far, we are seeing what I called “normal, healthy, routine and expected” when the nice folks from NBC Connecticut stopped by yesterday. Here is the link. I commented on Twitter how interesting it was that the media paraded out all of the permanently negative pundits for their victory lap. People who have been negative for 10+ years somehow think they have been proven correct and NOW it’s finally different. The bull market is over, according to them. At least they’re consistent! I have also found it ironic that so many of the people who completely missed this decline are the ones now opining on how to play it and when it will end. At least it caused me to chuckle. I remember how so many pundits told investors to sit tight the entire way down from 2007-2009 and then crowed when stocks finally rallied. There’s just no accountability and that leads to no credibility. In my case, I am accountable to my clients every day, week, month, quarter and year. Numbers don’t lie and sometimes over the years I have to do a mea culpa. In plain English, every now and then, I have to admit that I stunk. I want to thank the good folks at Yahoo Finance and Seana Smith for doing a follow up segment with me via Skype to find out what my thoughts were on the decline after warning of this on September 25. You can find the discussion at the 5:20 mark on the link below. Boy, I cannot believe how fat I look over Skype! Am I that fat? I probably could use a little weight shedding into winter! Back to the topic at hand. As you know, I rely a lot on history for a lot of my analysis. While markets may not repeat, they do rhyme as Twain is purported to have said. I went back to 1985 and looked for times when stocks declined at the same that the yield on the 10 year treasury note was rising considerably. Let’s pause for a minute. Most people think that stocks always go down when long-term interest rates rise and that bear markets begin with rate spikes. Well dear readers, the facts aren’t in evidence to support that. In fact, bear markets typically begin with long-term interest rates in decline as the market shifts to a more defensive posture. In other words, the stock market begins to anticipate some kind of system or economic weakness ahead of the bear market so long-term interest rates roll over. With that theme in mind, what I found since 1965 was really interesting. 6 times we have seen the stock market pullback more than 6% with the yield on the 10 year treasury note rising sharply right before. It’s has not happened all that often. The first and granddaddy of them all was 1987. Before people start with the emails, yes, I know it was an outlier and crashes are generational events. But it does fit with my theme. The yield, essentially the interest rate, on the 10 year treasury note is below from 1987. 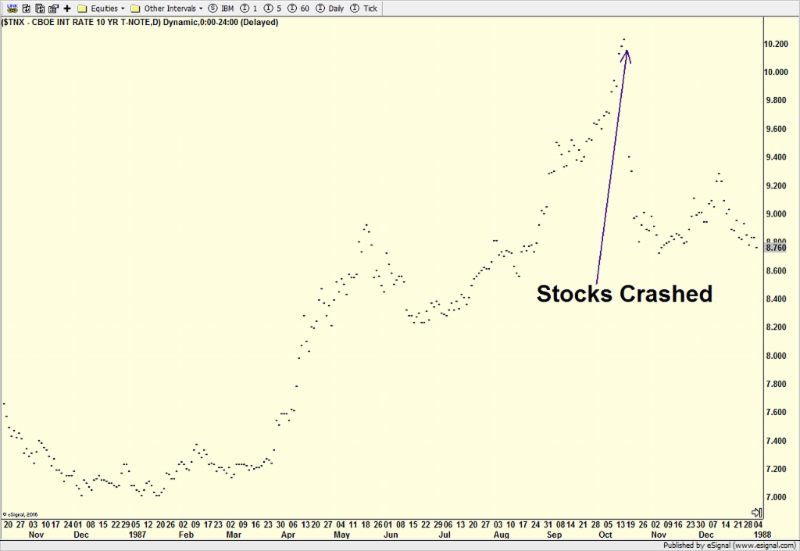 You can see how it was going up, up and up right until the day the stock market crashed which I am showing with the purple arrow. The second chart shows how stocks topped out in August 1987 but rates just kept going higher. First, stocks corrected 10% in September 1987 and rallied into early October before massive dislocations occurred with rates and the dollar into the crash. No recession ensued. Next, lets’ move to 1994 where long-term interest rates were rising sharply in February and March. Eventually, the stock market sent a strong message that it was not happy about the higher rates and corrected 10% as you can see from the second chart. 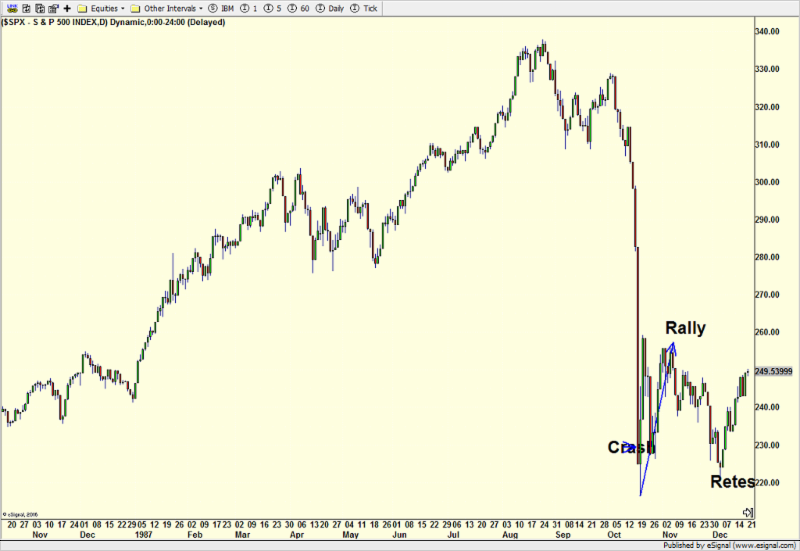 The real carnage took place in March 1994 with an almost straight line decline to the bottom. That decline was the largest in almost four years at that point and felt a whole lot worse to investors who were not used to the volatility. 1996 is next and you can see a steady rise in long-term rates all year before stocks said enough was enough. The July pullback was the largest decline since 1994 with rates being a primary driver. The second chart, just like 1996 and 1987 before it, saw the real peak in stocks well before the downside acceleration began. It’s almost like stocks peaked, routinely pulled back, tried to rally and then fell hard under their own weight of higher rates. 2006 is below and the theme remains the same. Interest rates, interest rates, interest rates. In 2006, they ran hot all year right to the peak which also atypically coincided with the high in stocks. 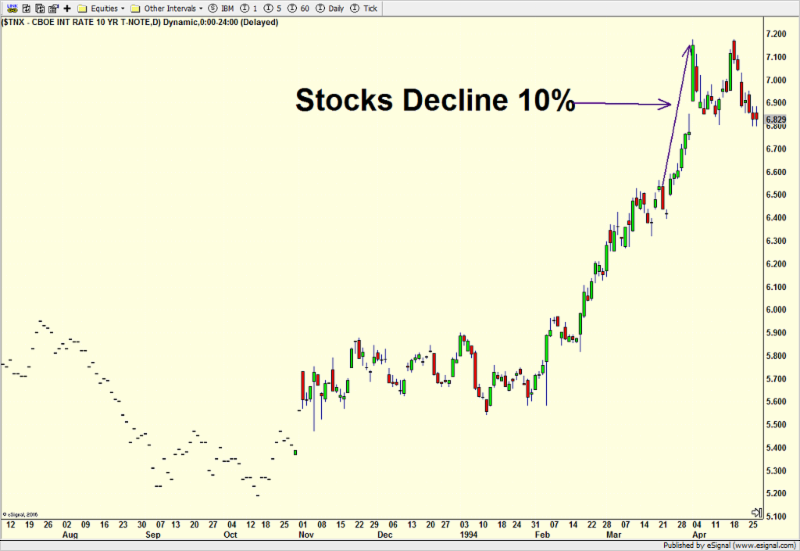 The stock market had a very simple 9%+ decline without much complexity like in previous years. And now we come to 2018 where this theme plays out twice. Rates were rising sharply since September 2017. And while there were other factors involved in the Q1 decline, like volatility products and China, I am 100% the same was true in prior years. 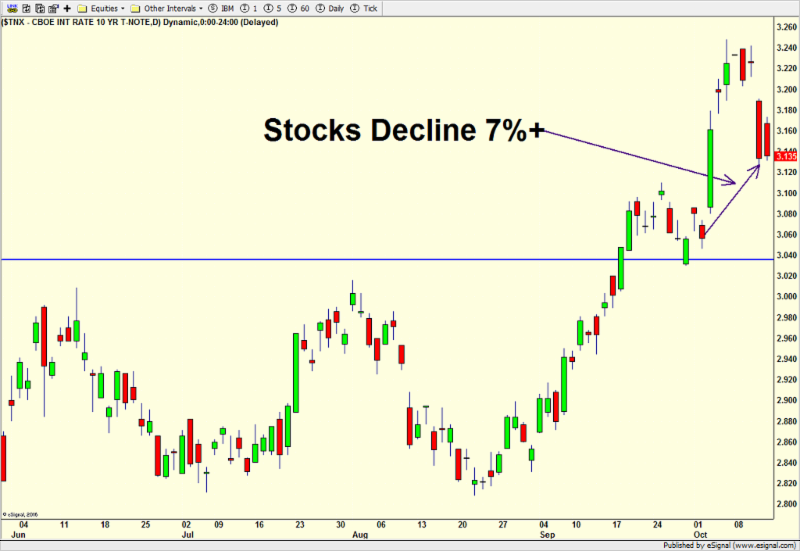 Interest rates laid the groundwork for some spark to cause the decline in stocks. On the second chart, you can see the January high in stocks followed by a sharp decline with much complexity. 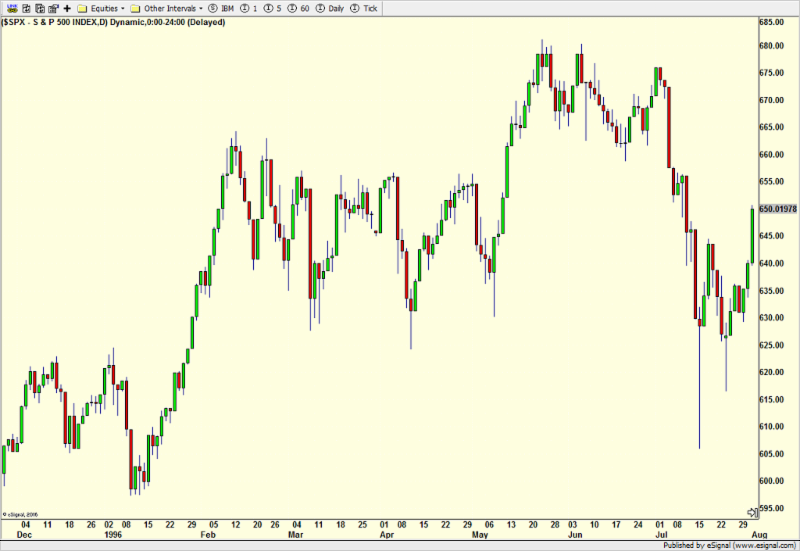 That’s similar to 2006 although with more “crash like” action with a few huge down days in absolute terms. Today, we are seeing a similar landscape. Yields on the 10 year note have been spiking since August. Stocks basically peaked in September with a secondary peak in early October and have fallen sharply. In all cases listed, stocks quickly bottomed and rallied to new highs although 1987 took the longest after such a large decline. None were part of long-term declines. The economy also continued to expand without recession in the near future. 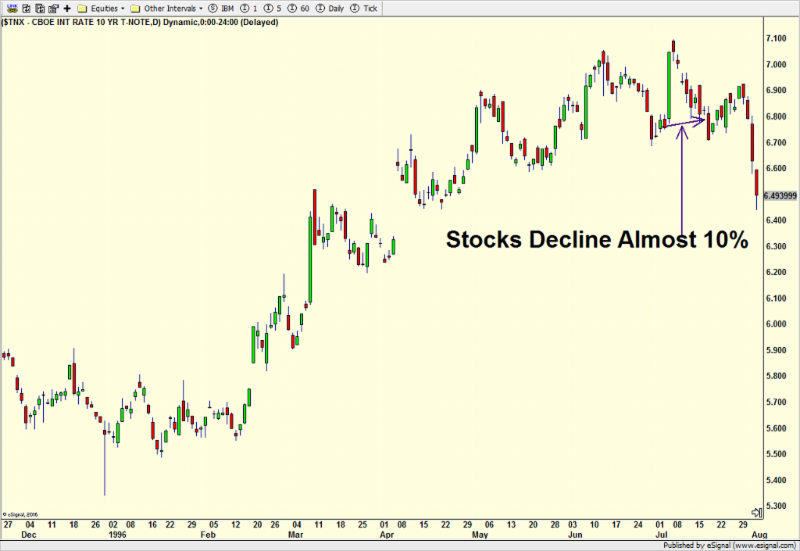 A much more worrisome warning will come when interest rates begin to roll over with stocks marching higher but the foundation of the stock market crumbles. That’s seen at almost every single major peak of the last 100+ years. It’s something that’s on my radar screen for 2019 and 2020.